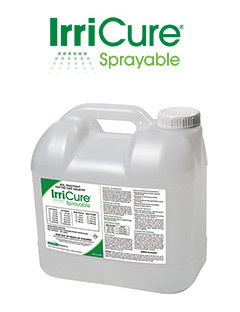 IrriCure Sprayable is a concentrated penetrant that conditions the soil to improve rewetting and irrigation efficiency. Formulated to tank mix with applied nutrients and other turf chemicals, IrriCure Sprayable helps facilitate better dispersion and uniformity in the soil. Compatible with most turf chemicals, it’s a cost effective way to enhance the products in the spray tank. In research comparing leading products, IrriCure Sprayable tests significantly stronger and faster in breaking surface tension and dispersing water and nutrients in the soil profile. IrriCure Sprayable is compatible with most turf chemicals and fertilizers, including Daconil and Banner. It should not be used with Primo or other growth-regulating products. Field-testing is recommended on a small area before spraying to assure safety concerns are met.